In the old days (before wooden crates, which came before cardboard crates), apples were shipped from (or by) farmers to stores in big barrels, and the shopkeeper or customer pulled the apples out of this big wooden barrel. The wise storeowner was careful to check frequently and remove any bad apples before they caused more to go bad. 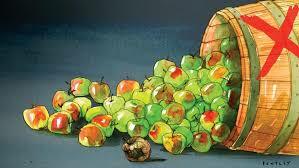 But where we REALLY see this proverb proven is in the “public schools” – and if it is NOT the barrel (the school system itself) which is rotten, the rotten apple is generally NOT one of the students in the school, and for that matter, not often one of the teachers. No, the reason we have to believe that the barrel is rotten is because the rotten apples that we see (and suffer from) are the administrators: the school board, the superintendent, the vice-superintendents and deputy superintendents and the principals and the vice-principals and the deputy vice-principals, and of course, the administrative staff: no, NOT the secretaries or even the school nurses: the academic dean and and the counselors and career advisors and all their ilk. And the rot has been spreading for more than half a century. Indeed, we can trace some of the rot way back to those glorious days of old when the Forty-Eighters fled Europe for the new land of America. The socialists and all their comrades, having failed to overthrow the Holy League and the post-Waterloo order in Europe, fled to the States. Bringing their infection of statism and socialism, including government-run, tax-funded schools and such disguised evils as kindergarten and (Prussian) order, to the land of the free. The results came both quickly and slowly, both openly and hidden. The Republican Party, the War Between the States, the rapid spread of “public schools,” the flowering of the concentration camps called Reservations, and much more. It took a long time for the system to be fully developed, of course, well over a century in fact. Locally run schools were quickly subordinated to a State Superintendent of Schools (forerunner of the Departments of Education), but there was still the facade of local control. Money was dangled in front of the locals, and the parents, competing systems were trashed and often hounded out of existence. And then, once they thought that they were on the final run to victory (that March through Georgia, that Drive deep into the Ruhr and Austria), they sped up and revealed their true nature. The Great Society with its panacea built on the suppression of segregation (itself a legacy of government), unionization, the banning of any sort of religious observance in the schools by the same courts, the vast funding and merging of pure welfare (school lunch and then meal programs, the increasing standardization of curriculum and texts and tests, the mainstreaming of deviancy (starting with beatniks and hippies and continuing on to homosexuals and transgenders with more to come), the push on jobs (good little robots) and the dumbing down and wholesale betrayal of students, each generation worse than the last. To say nothing of the replacement of education with indoctrination, facts with propaganda, and the wholesale corruption of teachers. I’ve seen almost sixty years of it: when I was in school myself, 1st through 12th grade, one or both of my parents were teachers in those same schools: I saw it from the inside in the 1960s and early 1970s. And then from the outside, first as an interested observer and then with my children (mostly in private schools and home-schooled) and through friends and family in the GRTF schools. And the rot is no longer just in the “public” government-run, tax-funded schools. The private schools, from pre-school to post-graduate studies are not far behind. The religious schools have mostly converted to the religion of humanity and/or the state. The great schools of the past, birthplaces of the great minds and dedicated personalities that fought for liberty and human progress have become bastions of tyranny and group-think. And the people who started that process are nothing but the spiritual ancestors, the progenitors, of the transnational progressives that are destroying society and the world today. 1. No praying except in “free speech zones,” at Clemson University. 2. “Christian University” offers credit for internships with Planned Parenthood; the university is Texas Christian University, associated with the denomination Disciples of Christ (who call their local congregations “Christian Churches” even while denying the life and teachings of Him for Whom they are named. I could go on, but the points make themselves. Today’s American public schools are places of evil, but it is NOT something that just suddenly happened one day. It has been developing for years. I’ve also made this appeal for years. Go and find something – ANYTHING else- to get your children AWAY from these places of misery, force, hatred, and tyranny. Stop supporting public schools: stop honoring school teachers for being essential public servants when they are at best stooges for the people who abuse millions of children (and often their parents) daily, and when all they do is facilitate the true goals of public education since the 1840s, producing mindless cogs in the human machinery of the state. Stop supporting the theft of your money and that of your friends, family, neighbors and communities to support the mindless circuses of school sports, the risking of children’s lives by busing and enforced incarceration in prisons in the middle of neighborhoods you would not enter unarmed (and with all the nice invitations to gun-free schools). Stop supporting politicians who say it is all for the children, while lining their pockets and those of their cronies and the unions with money stolen from you. This entry was posted in Nathan's Rants and tagged abuse of children, child abuse, degradation, destruction of society, evil schools, government-run tax-funded schools, progressives, schools, Transnational socialists, Tranzis. Bookmark the permalink. I am with you on this 100%. I try not to weep. The manifestations of this decay in what were to be the hallowed halls are the cause of so much anger and resentment. The perversions becomes ever more. While not completely unexpected, one never is fully prepared for the horrors.